Fennel is a popular ingredient that is used in the Indian kitchen. Also used as mouth freshener after meals and as an aid to digestion, fennel seeds are a mild diuretic as well. Read about the medicinal uses and home-remedies using fragrant fennel from here. As an infusion, fennel seeds can be gently cleansing and toning for the skin, and they can help reduce puffiness and superficial irritation. Thyme is also a wonderful herb that has antiseptic properties and is a main active ingredient that is used in Listerine mouthwash. Before the advent of modern antibiotics, it was also used to medicate bandages. It has also been shown to be effective against the fungus that commonly infects toenails. As for its cosmetic uses, it is a good astringent, An essential oil of common thyme is made up of 20-55% thymol. So a cleanser with these two ingredients would be great for the skin. Put thyme and crushed fennel seeds (buy from here) in a bowl. (If you cannot get fresh thyme you may buy dried thyme from here.) Boil water and pour it in this bowl. Now add lemon juice and steep for 15 minutes. Strain the infusion and store the liquid in a glass jar or bottle in the refrigerator. This is a gentle DIY cleanser that’s perfect for normal skin and can be used regularly. Dab it on your face and neck with a cotton ball, and rinse. wow, this is something i really need. Fennel has been used throughout history as an aid to digestion or as a slight diuretic. As an infusion, fennel seeds can be gently cleansing and toning for the skin, and they can help reduce puffiness and superficial irritation. 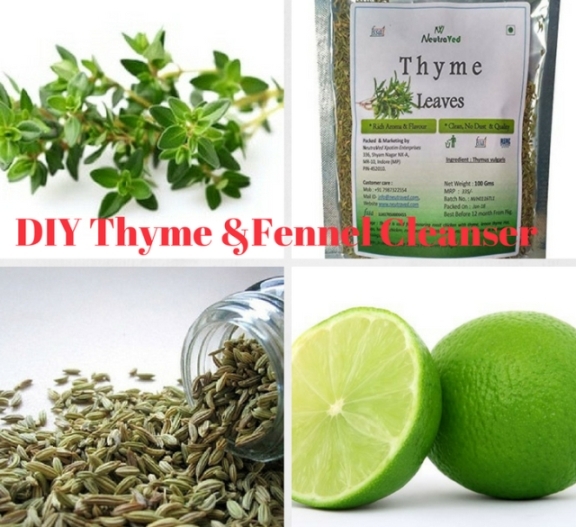 Thyme, which is used in antiseptic preparations, is a good astringent. Because this cleanser is very gentle, it can be used each morning. Dab it on your face and neck with a cotton ball, and rinse. Take two tablespoons crushed fennel seeds and half cup of buttermilk. Heat the milk and fennel seeds in the boiler for half an hour. Turn off the heat and let it cool for two hours. Cleansing cream is prepared and you can keep and use it for two weeks. Thyme-This herb is used for its toning, refreshing and disinfectant properties. Mix a tablespoon of the dried herb with three or four tablespoons of witch hazel in a small sterilized jar, and shake it up. After letting it brew for a half hour or so, you’ll have a natural toner that will help keep pores unclogged.